Pluscom’s this Firewire IEEE 1394a 6-pin to 4-pin connectors provide High-speed data transmission of 400 Mbps. Molded ends for durability and long life. Superior shielding reduces error rates and maximizes data transfer. 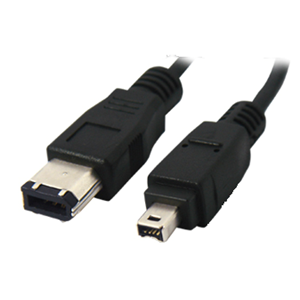 This cable is most commonly used for connecting to devices such as FireWire Hard Drives, FireWire CD-RWs and other 1394 computer peripherals.